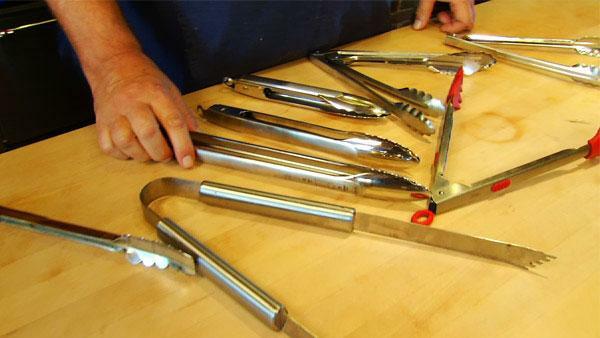 Find out which tongs you should have stocked in your kitchen. Tongs should be strong and made with heavy enough metal so the tips don't bend. If tongs are too light weight they will not be able to lift heavy items like roasts. You will want to have tongs of various lengths. Long ones are for reaching across a grill and shorter ones are for turning over smaller items. Silicone on the end of a tong can help you grip items. Bruce Aidells shares a recipe for grilled lamb chops with a roasted lemon vinaigrette. Bruce Aidells shares a spicy recipe for lamb chops. This simple but exotic dish is inspired by the cooking of Morocco. In Morocco, these one pot stews are called "tagines" and are named for the cone-shaped vessel that is the customary pot to prepare the stews. Executive Chef Ben Paula makes a tasty roasted corn and heirloom tomato salad.